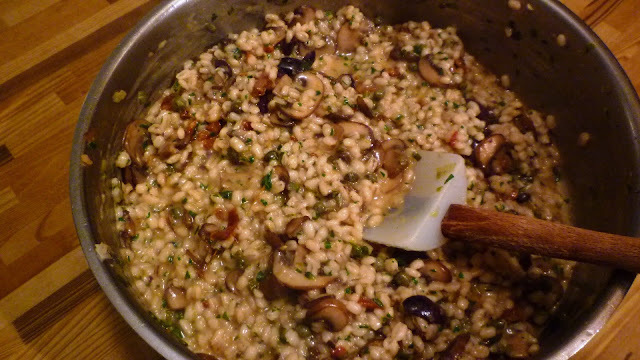 A few years ago I devoted a couple of posts to making "risotto" from farro. At the time, farro was a new grain to me. But the idea of making a non-rice grain into a creamy risotto-like dish was not new. 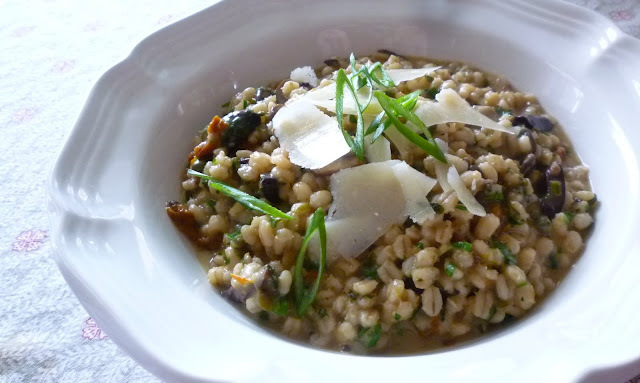 Years before I came across farro, we were making and serving a barley risotto at the restaurant where I worked. I haven't really thought much about barley risotto in years, but this winter when I was putting together a slate of recipes for my class on grains, I decided I wanted to revisit that dish. Both farro and barley make admirable stand-ins for Arborio (or Carnaroli) rice in risotto for a couple of reasons. First, they both have a wide window within which they can continue to absorb liquid while still maintaining an "al dente" texture. Secondly—and most importantly—when cooked, they exude enough starch to thicken any extra liquid that is present into a creamy, fluid sauce. Both barley and farro can be made into risotto using the exact same method that is used with rice: by adding hot liquid a ladleful at a time while stirring regularly, until the grains are swollen, tender (but with texture), and suspended in a creamy liquid. As with classic risotto, it is a process that requires almost constant attention from the cook. Since the results are delicious, most people don't seem to mind the extra effort. But this labor intensive process is only one of the options when you make "risotto" with barley or farro. For both of these grains you can just cook them as you normally would—by boiling in salted water or using the "pilaf method" (sautéing the grain in some fat before adding a measured amount of hot liquid, covering and cooking at the lowest heat until the liquid is absorbed). To make "risotto" you simply add more liquid to the finished grain (or, add the cooled cooked grain to a pan with a small amount of simmering liquid), add butter...and then stir, stir, stir....until the grains of barley (or farro) are suspended in a creamy, fluid liquid. This "finishing" process takes less than five minutes. Nothing could be easier. And the results are delicious. Bear in mind that no matter which of these methods you choose to use, you must use pearled barley. The pearling process is what enables the barley to release its starch. Whole barley (hulled or hull-less) will not release the starch needed to produce the final creamy sauce. 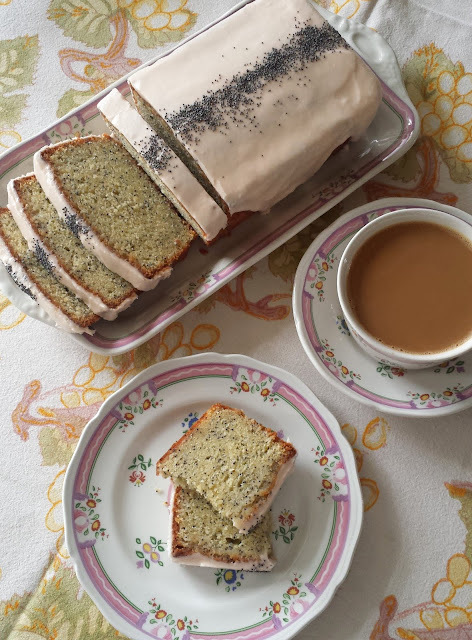 The recipe I am posting today was inspired by that long ago dish we served at The American restaurant. If memory serves, it was brought to us when Chef John Ash visited to teach a class. It is filled with the vibrant flavors of the Mediterranean: tangy sundried tomatoes, briny olives, and sharp capers. I have no memory of how we prepped the barley before finishing it as a risotto, but I chose to prepare it with the pilaf method (with scallions and chicken stock) since this would add even more flavor. To make the dish a bit more substantial (and appropriate for a light entrée) I decided to add some sautéed mushrooms. 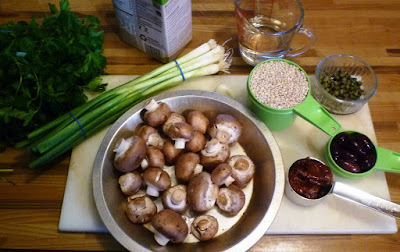 I think they add just the right touch (I love mushrooms with barley), but you could leave them out if you prefer. Either way, I think you will find this "risotto" to be very flavorful....and very satisfying. Heat 2 T. oil in a medium-sized heavy pot set over medium to medium high heat. Add the white part of the scallions and cook until tender. Add the barley and cook, stirring, until well coated with oil and sizzling—about 2 minutes. Add 2 cups chicken stock along with a pinch of salt and bring to a boil. Reduce the heat and simmer, covered, until all of the liquid is absorbed and the barley is tender (but still has nice texture), 25 to 35 minutes. Remove from the heat and let stand, covered, 5 minutes. If using right away, set aside until ready to finish the risotto. If working ahead, spread the barley on a rimmed baking sheet to cool. Scrape into a container, cover and chill. Bring to room temperature before proceeding with the recipe. To finish the risotto, warm the remaining tablespoon of olive oil and a tablespoon of butter in a wide, shallow pan (a 3 to 4 qt. braiser or sauteuse is perfect) set over medium hi heat. When the butter melts and the foam subsides, add the mushrooms and sauté until the mushrooms are golden and any liquid given off has been absorbed or has evaporated. Season lightly with salt and pepper. Add garlic and cook briefly, until fragrant (do not let it burn). Add the white wine and reduce to a glaze. Add a cup of the remaining stock and bring to a simmer. Add the cooked barley along with the green portion of the scallions, the sundried tomatoes, the olives and the capers. Bring to a simmer, stirring regularly. Stir in 2 T. of the butter and as much of the remaining stock as you like to achieve the consistency you prefer. The barley should be creamy and fluid, but not soupy. Finish with Parmesan, parsley and the remaining butter (which will add to the creaminess of the dish), if you like. Serves 4 as a main course and 6 to 8 as a side dish. Variation: To prepare the risotto without mushrooms, simply place the stock in the pan, add the cooked barley and heat through and finish as directed.